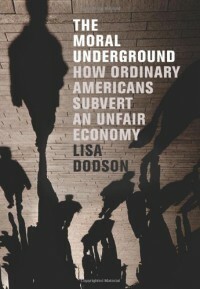 After years of conducting focus groups and collaborative social research, Dodson wrote this book summarizing her findings. Mixing together anecdotes and US statistics on poverty, Dodson examines a country without universal health care, a livable minimum wage, or affordable care for children, the elderly, or the disabled. As Dodson says, poverty created and maintained at an institutional level is bad not only for the well-being of those in poverty but also harms everyone else in society. She breaks down the exact numbers of people's wages and bills, and presents the nearly impossible logistics required to raise children as a low-wage earner. She talks a bit about the strategies individuals have used to combat these structural problems, like allowing workers to have flexible shifts, "losing" diaper inventory, or letting uninsured patients use other people's insurance. She never gets in depth about these strategies for fear of making them more difficult to do, but it's still clear that even though she calls middle class individuals' efforts to ameliorate suffering due to poverty a "moral underground," there really isn't an "underground" in the sense of an organized network. From her descriptions, at least, it seems like it remains very disconnected and individual. None of this is breaking news, but I like the way Dodson frames it all. I could feel her frustration biting through the numbers and her bland but leading questions to those who blame structural issues on individuals' work ethics.